Not the kind who survives on slap-dash omelettes and store-bought biryani? Love having pot-luck get-togethers at home with friends and fam? Kolkata has a bevy of good value, mid-range kitchen and tableware places where you can stock up without feeling the pinch. Walk along the pavements at the end of the lane which houses the boutique, Kanishka on Hindusthan Road and you will find an array of stalls selling everything you could need for your kitchen. They have plates in all sizes and colours, cups, glasses, casseroles, crystal jugs, salt-pepper shakers, and much more. You will find all kinds if designs and interesting patterns - many of them are surplus stocks from consignments meant for hotels and restaurants. We came across this tiny open stall in the chaos of Gariahat crossing where you can stock up on ceramics, glass jars and bowls at very affordable prices. Located on the pavement opposite Traders Assembly, you will find a lot here for your kitchen needs. ovenware, glass bowls, casseroles. storage containers for your cereals, pretty tea and coffee cups in pastels and funky prints, jars in all shapes and sizes, salt-pepper shakers, and those glass bottles with different prints on them and with lids. Most of the ovenware is branded stuff like Borosil and a few from France and Turkey. Others, like the cups, are locally made. This huge complex houses hundreds of shops selling clothes, home decor, food items and kitchenware. Browse the state emporia stores first - you will get stuff from all over India. The Art Furniture (which is a strange name for a shop that stocks mostly kitchen ceramics!) is one of the few remaining places in Kolkata that still stocks the signature blue-and-white Domit range of ovenware. Rajaniklal, the iconic Kolkata crockery store on Park Street, has been the go-to place for chefs, restaurant insiders and us ordinary people who love the good things of life. 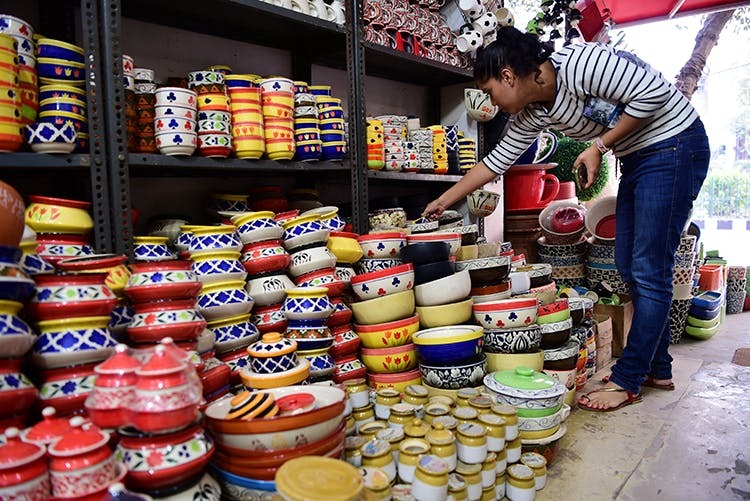 Their range of very ceramic, oven-proof kitchenware with signature designs in blue and white, greens, and oranges have been bought by Kolkata families over generations. Unfortunately, the store on Park Street does not stock this special Domit line any more. Still, it stocks a pretty huge variety of designs. And they make for great gifts too! Kolkata used to have quite a few Manjusha outlets, but they are hard to find now largely thanks to the proliferation of its snazzier cousin, the Biswa Bangla store. Hit up the Manjusha opposite Lake Mall for reasonably priced Bengal-made handicrafts and handlooms. They are also one of the few shops in the city that still stock the Domit range of kitchenware with the signature designs. Pick them up before these too are gone. The stores inside this iconic British era market can be you one-stop destination for all kitchen needs. They stock an amazing variety of kitchenware from Chinese tea mugs with lids and strainers to soup plates, ovenware, trendy glasses, and more. Love baking? Pick up cute cake stands from Staffordshire Stores — perfect for displaying all those tarts, pastries and cupcakes for a high tea get-together at home! Or buy a cut-glass wine set for your bestie's wedding. Some of the sets are from France, Italy and Turkey and cost quite a bit more.